Why Nuclear Power when there are more safe and efficient processes? Sounds like a highly dubious tradeoff to me, at a time when technology offers so many better options. As my engineer-brother once said dryly, “it’s a hell of a dangerous way to boil water,” which indeed it is. When these things go wrong, as at Three Mile Island, Chernobyl and Fukushima, the results are socially disastrous. 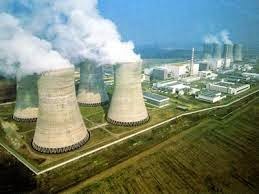 The French are world leaders in the development of nuclear power generation and yet the French Atomic Energy Commission has concluded that technical innovation cannot eliminate the risk of human errors in nuclear plant operation. An interdisciplinary team from MIT have estimated that given the expected growth of nuclear power from 2005–2055, at least four serious nuclear power accidents would be expected in that period (Wikipedia). Four more serious accidents in the next 50 years? For me (and perhaps for you) that’s an unacceptable existential risk. And by the way, got a place for those spent fuel rods? “Nope, but we’re working on it,” is the answer to a question that was originally asked some seventy years ago. Old processes with old technology and the old burning questions still unanswered, when we are in a new century, with new opportunities and a new challenge. In the more safe and efficient processes area, solar and wind are getting the press coverage (both optimistic and pessimistic), while tide and geothermal are less mentioned, but have great potential. We’re creeping forward on the former and largely ignoring the latter—at a time when technology is available and the clock moves inevitably forward on environmental apocalypse. Spain is at the forefront of Gemasolar Thermosolar development, with a fascinating project in operation that removes the obstacle of solar ‘going down’ during the night. 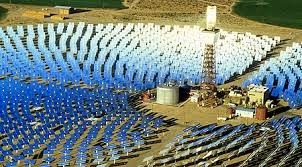 A molten salt heat storage system is at the heart of this concentrated solar technology and focused it is, aiming computer programmed mirrors at a single spot on the ‘salt tower’ to produce intense heat. Pretty much what we all did as kids, focusing our magnifying glasses at a spot on a leaf to set it burning. Who knew that would become a source of electricity. Traditional electric generators are steam-driven, the nuclear type as well, hence my brother’s remark about dangerous ways to boil water. Gemasolar, located within the city limits of Fuentes de Andalucía in the province of Seville, Spain is the first commercial solar plant with a central tower receiver and molten salt heat storage technology. It cost approximately half a billion dollars and successfully powers the equivalent of 27,500 homes and its storage system allows it to produce electricity for fifteen hours without sunlight, at night or on cloudy days. It’s been doing this since 2011 and tweaks along the way make it increasingly efficient. A solution? Obviously, not entirely, but a powerful advance over passive solar and one to be watched and emulated. One should keep in mind that Gemasolar is a ‘pilot plant’ and its costs reflect that. They will certainly come down remarkably steeply as the production of such plants expands. They are very applicable to industrial parks, outlying locations surrounding major cities and totally powering small cities throughout the world. It was interesting to me that Gemsolar was located within the city limits of Fuentes de Andalucía. How comfortable would you be with a nuclear plant inside your city limits? How comfortable can any of us be, so long as nuclear extends its reach across the planet? Wouldn’t it be lovely if Big Oil reinvented itself as Big Power and got their collective shoulder behind the wheel of renewable energy? Wouldn’t it be lovely if they gradually abandoned their questionable resources in Saudi, Iraq, the North Sea and the poisonous Tar Sands of Canada, as they put their expertise and finances behind something that might diminish both the sources of war and environmental extinction? Wouldn’t it be lovely if politics got out of the way and demanded it? Lots of solar makin' lots of heat. Indeed, it would be loverly. "Weinberg realized that you could use thorium in an entirely new kind of reactor, one that would have zero risk of meltdown. . . . his team built a working reactor . . . . and he spent the rest of his 18-year tenure trying to make thorium the heart of the nation’s atomic power effort. He failed. Uranium reactors had already been established, and Hyman Rickover, de facto head of the US nuclear program, wanted the plutonium from uranium-powered nuclear plants to make bombs. Increasingly shunted aside, Weinberg was finally forced out in 1973." Wikipedia: Thorium is extracted mostly from monazite: thorium diphosphate (Th(PO4)2) is reacted with nitric acid, and the produced thorium nitrate treated with tributyl phosphate. Rare-earth impurities are separated by increasing the pH in sulfate solution. Pretty complicated stuff compared to concentrated sunlight and liquid salt.